Samsung’s Galaxy S9 Plus, which was launched in March 2018 along with Galaxy S9 flagship smartphone, is one of the first phones to feature a f/1.5 lens aperture. The new Galaxy phone is being recognized as one of the best camera phones right now, but so is Google’s Pixel 2. Google’s latest offering has been termed as the best all-around camera phone in the world. So, how does Galaxy 9+ expect to beat that? Or can it? 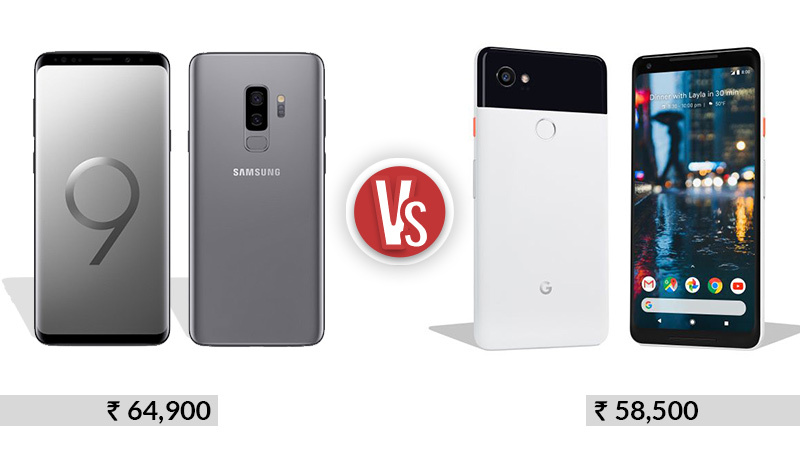 Let’s find out with this detailed comparison between Google S9 Plus and Google Pixel 2 XL, in terms of camera, speed, performance, battery and everything else that matters. Ever since its launch, the Pixel 2 XL has been known as the phone with a killer camera, super screen, and an amazing Android experience. However, Galaxy 9 Plus has the capability to beat all that and some more. Let’s see how it stands against the already popular Pixel 2 XL. The Pixel 2 XL has been designed to take superlative pictures through features like clever image stacking and processing. Even though it doesn’t have a super slow-motion feature like its rival Galaxy S9 Plus, the phone is still capable of taking high-quality pictures, even in low-light scenes. The Google Pixel 2 XL features a single 12MP camera with f/1.8 aperture. Even though there is no secondary camera on the back, it still takes amazingly beautiful bokeh effects images. Other camera features include phase-detect and laser autofocus along with Google’s image processing algorithms, multiple shots, dynamic range, superb colours, bokeh effects (dua-pixel approach), etc. Galaxy S9+, on the other hand, has dual camera sensors on the back. The main 12MP sensor comes with f/1.5 aperture that is capable of absorbing loads of light making it possible to take beautiful pictures even in low light. S9 Plus has a wide angle lens which provides wide angle images. There is also a secondary 12MP depth camera for bokeh and other effects. Another plus point is the adjustable aperture, that automatically swaps between f/1.5 and f/2.4 as and when required. The 8MP front camera is also quite amazing at taking beautiful selfies. Other camera features include autofocus, panorama, live focus, sports mode, stickers, hyperlapse, slow motion and more. 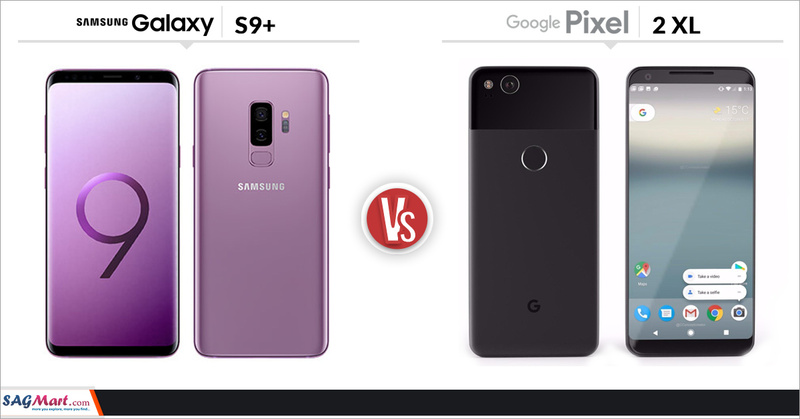 When you compare the cameras of these two smartphones, you will find that the Pixel device takes rather sharp and clearer images than the S9, however, the latter takes smooth and clear images even with zoom. The Galaxy S9 Plus camera has a dual self-adjustable aperture system which works great in every situation. The smaller aperture in S9+ provides benefit in the form of more detailed images than what Pixel 2 takes. The noise processing and sharpening features will remove most of the noise from the picture but also it may blur the image quality a little. The dual-aperture system works automatically, with no human control. In addition to the standard video recording feature, the Galaxy S9+ camera is also capable of recording slow motion videos. The camera records 4K videos at 60 fps, which is probably the best in an Android smartphone. Back to Super Slow-mo for Galaxy S9, the phone can shoot videos at 960fps at 720 HD resolution. The super slow-motion feature is great for recording detailed videos when you need to highlight the various parts of the target, however, you may need lots of light for it to work perfectly. The Galaxy S9+ back camera comes with 2+ optical zoom which works unexpectedly fine, even beating the likes of iPhone 8 Plus and Pixel 2. Thanks to the optical zoom feature, even zoomed in images look pretty clear and sharp. Motivated by the success of iPhone’s Animoji feature, Samsung found it convincing to add a special AR Emoji option to its latest smartphone, which more or less works in its favour. The AR Emojis given with the Galaxy S9 Plus is fun and cool and works fine for all situations. The 2D tracking easily maps your facial expressions and modify stickers accordingly. Other noteworthy camera features include optical image stabilization, post-processing and sharpening and automatic colour balance, all of which make the phone camera suitable for low-light photography. As for the speed test, Samsung device performs better and faster than the Google smartphone. The bootup test shows that the Pixel device is a bit faster as compared to the Galaxy device. Apart from that, Samsung Galaxy S9 Plus beats the Pixel phone in speed at almost all the basic applications, including the loading time. 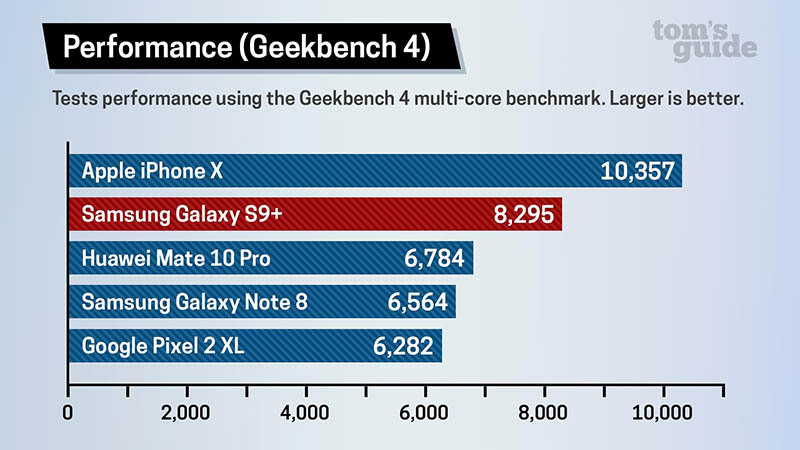 Since the Galaxy S9+ is loaded with the latest octa-core processor, it runs slightly faster than the Google’s offering. However, the difference is too minor to notice. The games, as well as videos, play very smoothly on both devices. The Galaxy S9+ comes with the Exynos 9810 processor (in the UK) and a similar yet weaker Qualcomm Snapdragon 845 Octa-core processor elsewhere. Both processors are quite powerful as compared to the older Snapdragon 835 processors available in the Pixel 2 XL. 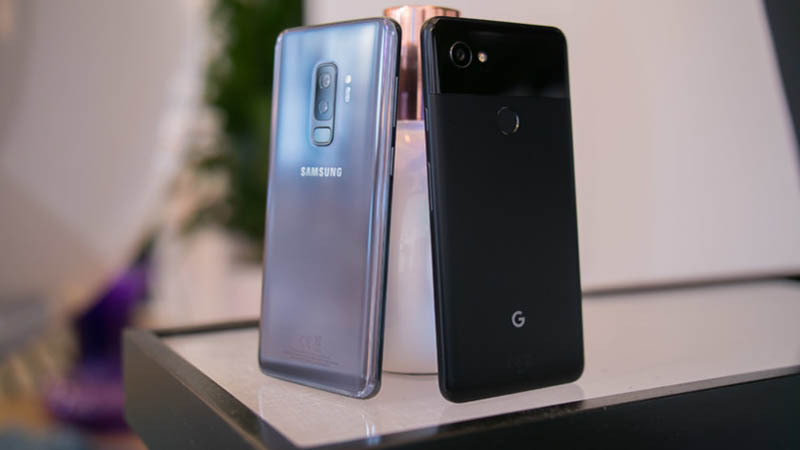 You may not see any major difference in everyday usage, however, the Samsung phone can perform well even in raw use conditions, such as hard-core gaming and long-duration video playing. Also, the Galaxy S9+ comes with a 6GB RAM over the 4GB RAM seen in the Pixel 2 XL devices. It further improves the phone’s performance and capability to multitask and provide a smoother mobile experience. The Samsung phone also has an integrated 64GB memory which is quite fitting for a device of this measure. There is also a microSD slot which can expand up to 400GB. Both devices support VR and have their own dedicated devices for the same. The PIxel 2 XL is a Google product and naturally runs on the stock Android OS. The plus point is that it runs the stock version of the latest Android OS and is bound to get the latest Android updates from Google. However, Galaxy S9+ is not far away in terms of software and OS quality. It comes with a customized Android Oreo-based OS developed by Samsung, which works more or less the same as the stock Android. There are no lags or slow speed when it comes to the software. 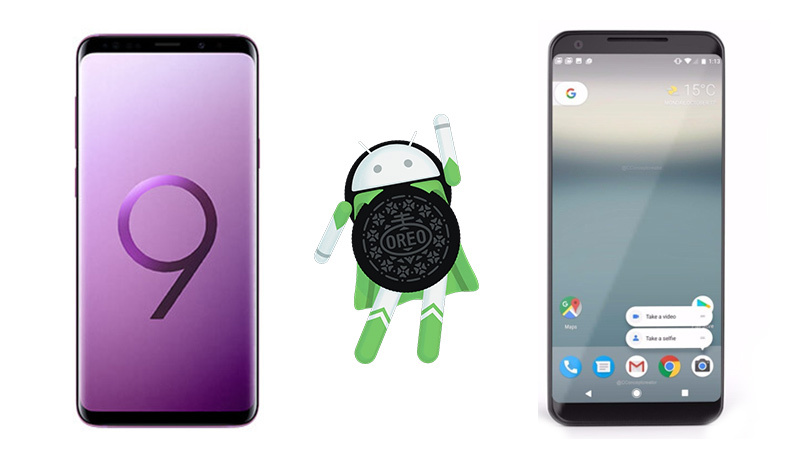 In terms of software (OS), stock Android would win almost every time, however, if you are looking to choose between these two phones, you should certainly go with the Samsung device. It has the power along with supreme hardware capacity to handle that power. And since it is a super-fast phone, you will not miss stock Android that much. 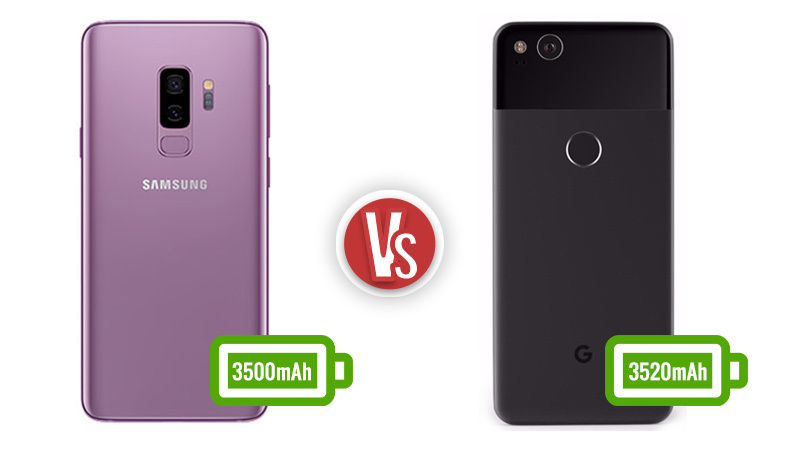 Both the Galaxy S9+ and Pixel 2 XL have almost the same capacity batteries. Whereas the S9+ comes with a 3500 mAh battery, the latter is powered by a 3,520 mAh battery. With steady yet regular use, both phones will last about a day, which is common for smartphones these days. However, the Galaxy device goes a step ahead as it has wireless charging feature, which the PIxel device doesn’t. The Samsung Galaxy S9+ is available in three colour variants – Lilac purple, Midnight black, and Coral Blue. The 64GB version of the device is priced at Rs 64,900 in India while the 256GB version can be purchased at Rs 72,900. The Pixel 2 XL is slightly cheaper than the competitor. The price starts at Rs 58,500 for the 4GB RAM, 64GB memory variant and goes up to Rs 70,000 for the 128GB model. The Galaxy S9+ can definitely be called a fine device. At this price range, it competes with the likes of Google’s Pixel 2 XL and iPhone 8 Plus. The phone is great in terms of almost everything. It has great cameras that produce superb quality pictures, especially in low-light conditions, a bigger and better screen, a powerful processor coupled with 6GB of RAM and adequate memory to handle any possible usage, good enough battery, wireless charging, all the latest connectivity options, the latest Android OS and much more. If you are looking for a phone in this price segment and already appreciate the Galaxy S8 and S8+ Plus, you won’t be disappointed with what the Samsung latest S9 Plus has to offer. In fact, you will absolutely love it; we do.